I'm such a geek. 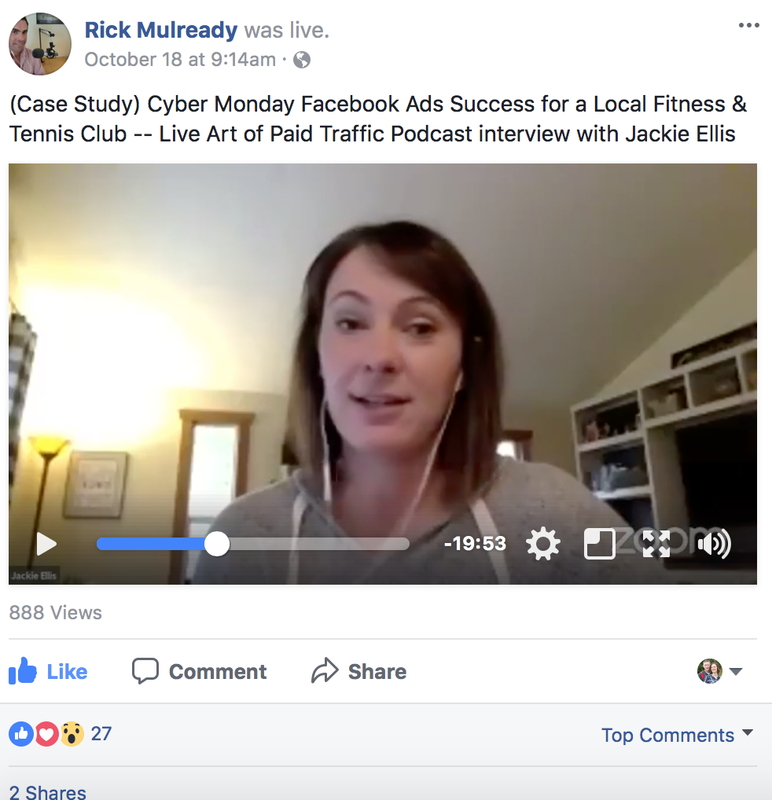 A few weeks ago I got to chat with one of my Facebook Ads mentors, Rick Mulready, on his podcast. If you missed our FB Live, click on the video to check it out. And don't forget to scroll to the end of this post to get my HUGE FREEBIE to help you run your own Cyber Monday Sale! Last year, I ran two Facebook Ad Campaigns for our Cyber Monday Sale. 1. We ran a promo video (we called "zero" for our zero initiation) to warm and cold audiences. You can see my targeting audiences as you scroll down. Click here to watch the Cyber Monday Promotion Video we used. For this campaign, I strictly ran ads to the Facebook feed. No Instagram. No Messenger. Just desktop + mobile feed. I used a blend of warm audiences based on video engagement and our email list plus lookalikes of those audiences. I threw cold interests into the mix and, as expected, they did not perform as well. My entire campaign was very "holiday-esque" with red and green colors. I kept the theme from my ad images running through my landing page, which helped the campaign feel cohesive. All of the offer details and fine print were listed on this page as well as a countdown timer to encourage a little FOMO. I actually had no way to sell our offer online due to our membership software. So I had to use a sales page where people would just reserve their membership by submitting their name, email and phone number. After I received their email and phone number, I called each person to schedule a time for them to come in to the club to complete their membership. There were no actual online sales, per se. We had limited memberships available (only 20 Tennis memberships) and did end up selling out, which created a waitlist of about 25 people that I had in my pipeline for months afterwards. I'll admit, it was a little clunky to do things this way. People who were reserving their memberships online didn't necessarily know if they were guaranteed a spot at that time until they received my phone call. This is something I'm working to improve for this year.